In the first of a series of features that'll form a mini Month of Kirby — ahead of the release of Kirby: Triple Deluxe in May — we look at a few games starring the pink mascot that never saw the light of day. Kirby has had a storied run as one of Nintendo’s most recognizable characters, having appeared in traditional side-scrolling platformers like Kirby’s Dreamland and Kirby’s Adventure, as well as more experimental titles like Kirby’s Dream Course and early DS hit Kirby Canvas Curse. While every Nintendo platform (save for maybe Virtual Boy) has had ample Kirby content, there have been several planned or in-development concepts featuring the small pink ball that haven’t seen the light of day for various reasons. Here are some Kirby games that were cancelled or never made it past the concept stage. Today, Rockstar Games is most associated with gaming mega-franchise Grand Theft Auto and other mature, complex titles like Red Dead Redemptionand L.A. Noire. Nintendo’s had occasional support from the company — Bully: Scholarship Edition, Rockstar Table Tennis and Manhunt 2 graced the Wii early in its lifecycle, and Grand Theft Auto: Chinatown Wars was widely acclaimed on the DS — but back in the days of the SNES, the developer was hard at work on a game featuring a young Kirby that would act as a showcase for the SNES Mouse. Unfortunately, the title was never completed due to the peripheral’s limited success. There is very little in the way of gameplay information available for Kid Kirby. Most of the details about the lost game come from ex-DMA employee Mike Dailly, who posted concept art and assets from Kid Kirby on his Flickr account. 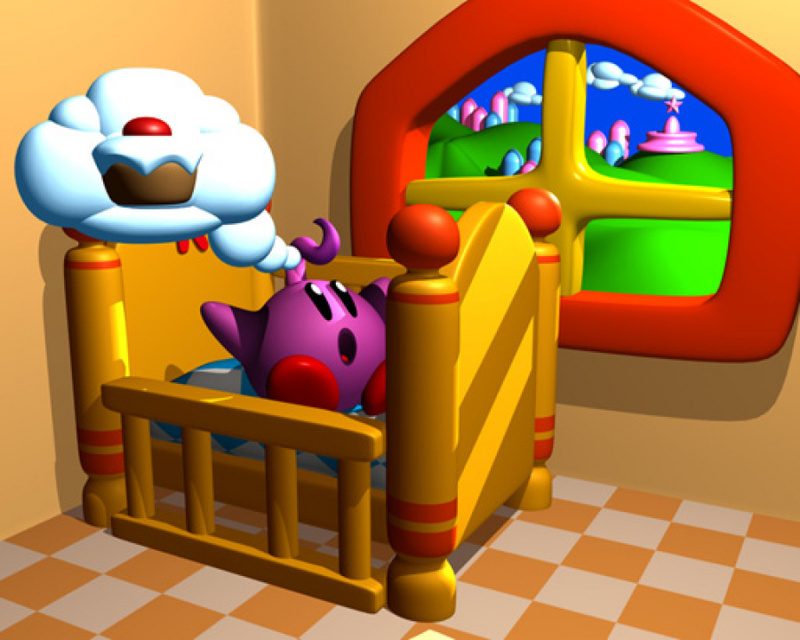 Art renders show a little Kirby with a cowlick in a baby crib, dreaming of what appears to be a cupcake. Dailly’s set also shows in-game tile graphics and some level design, which suggest that the the game would have been a puzzle platformer of some kind. Promotional art was sent to retailers, so the game was likely significantly along in development. Whether Kid Kirby would have brought success to the SNES Mouse is debatable; Kirby has always been a gentle, kid-friendly franchise, and adding “Kid” to the name may have turned off some older gamers. Alas, we’ll never know. 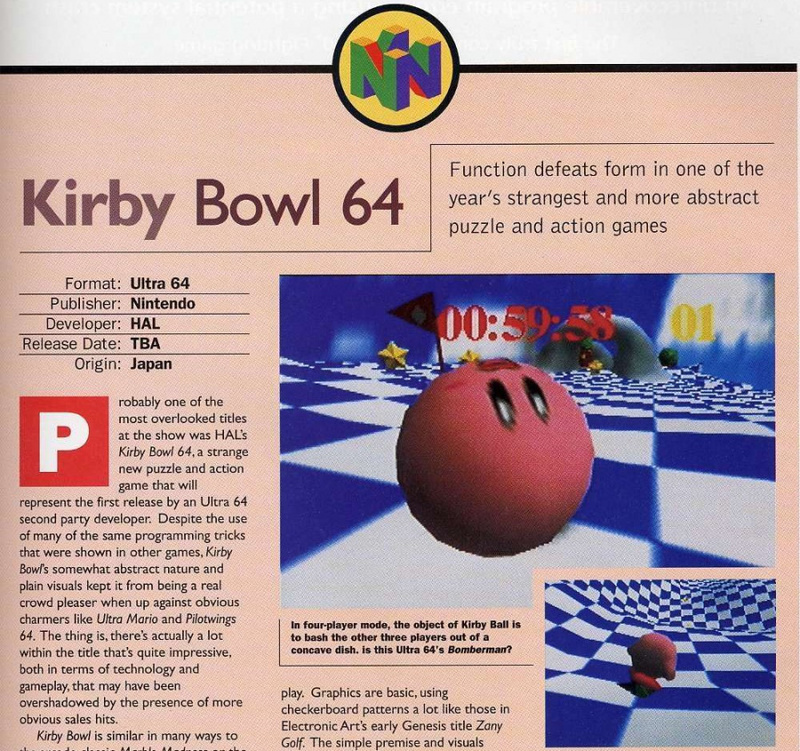 One of the earliest titles shown for the “Ultra 64,” Kirby Bowl 64 (named after the Japanese name for Kirby’s Dream Course) was conceived as a racing/rolling game for up to four players, with the objective of knocking the others off the stage. Later retitled Kirby’s Air Ride 64, other modes included a snowboard/airboard race. Perhaps due to the long development time and complex gameplay, this iteration would never be released, leaving Kirby 64: The Crystal Shards to represent the franchise on the N64. Kirby’s Air Ride resurfaced as a racer for the GameCube in 2003 to a somewhat lukewarm reception. The overly simplified gameplay didn’t resonate with all fans, and it would be the last main-series game that series creator Masahiro Sakurai directed (he still utilises the character in the Smash Bros. series). Sakurai-san cited the pressure to constantly work on sequels as part of the reason for his resignation from HAL Laboratory. Kirby Tilt ’n’ Tumble was the first Game Boy Color title to use motion tilt controls, and Nintendo planned a sequel that would require both the Game Boy Advance and GameCube in order to work. 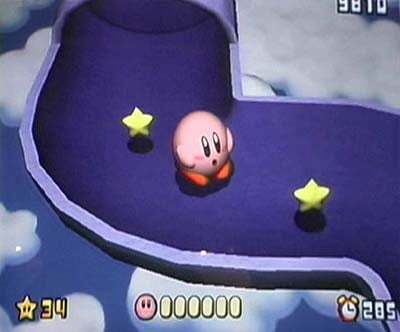 Players would use their GBA as a controller for the GameCube game and tilt their GBA to guide Kirby to the goal on the TV screen. The GBA/GameCube link didn’t take off, however, and development was eventually halted. At one point, Nintendo made the decision to take the Kirby character out of the title entirely, renaming the game Roll-o-Rama and continuing development, but the coverage for the game slowed and the experimental title was quietly cancelled. With popular titles like Kororinpa and Marble Mania, there could have been a place for this game; unfortunately, the unwieldy GBA/GCN connection proved to be its undoing. In an Iwata Asks interview for the Wii platformer Kirby’s Return to Dreamland, Satoru Iwata and his round table colleagues discussed three “lost” Kirby games that were in various stages of development over the course of several years. The first, according to HAL Laboratory’s Shigefumi Kawase, would have featured four-player co-op and was briefly shown at E3 in 2005. Ultimately, it was decided that the logistics were too complicated and the project was scrapped. The next project discussed would have been a fully 3D Kirby adventure, giving the player the ability to roam around freely in levels, but quality concerns led to its cancellation. The third abandoned project was a more traditional Kirby platformer that would feature animated, storybook-like visuals and enhanced copy abilities for the little guy, but development was ultimately halted. While it’s bittersweet to look back at what could have been, the Kirby series is in a good place. With Kirby: Triple Deluxe, his upcoming appearance in Super Smash Bros. for Wii U and 3DS, and whatever Nintendo has up its sleeve next, the love and care put into each Kirby title ensures that this iconic franchise is here to stay. Losing that animated, storybook-like game (presumably represented in the lattermost screenshot)... that hit me right in the gut. Last-Blade-3-canceled tier hurt. Kirby's never looked more in his element than in that screenshot, and considering how solid most Kirby games are (visually or otherwise), that's really saying something. I'm disappointed that they never pursued the 3D one sinply because Kirby has never had a proper 3D adventure yet. I think it's about time now, isn't it? I really like stuff that involves connections between multiple systems. I remember there being screenshots of the cancelled Gamecube kirby game. I agree on the storybook look of that image being the best. Dunno how I feel about that lifebar, and the clipping could use some work, but that's a very solid art style for the series. KDL3 and K64 were too light, and Air Ride and RtDL/TD are too defined and busy. With some fluorescent colors and whimsical patterns and elements like the ones in Kirby's Adventure, this would be perfect. All three of the final canceled Kirby games that would eventually become Return To Dream Land (or Adventure Wii, if you prefer) would have been awesome, imo. I'm a huge Kirby fan, and occasionally I'll go back and watch that old GCN trailer again. Honestly, I think that one looked a bit more fun than RTDL is. Of course, what really pains me is the loss of 3D Kirby. I've been kicking around a few ideas in my head for such a game for a while now, and when I saw that screenshot come up in an Iwata's Asks...man, that was painful. It looked exactly how I imagined it. Storybook Kirby looks interesting also, but aside from the art style it lacks the inherent intrigue of a 3D Kirby or the fleshed out presentation of that older trailer. Still, though, I'm sure it would have been great. I love finding out about cancelled games and what they could've been! In fact, this just serves to remind me that I need to play more Kirby games! As far as I'm aware, that four-player game was one of the many early iterations of Kirby's Adventure Wii! It went though a lot, apparently! A 3-D Kirby was canceled? *Nintendo why u no make 3D Kirby? How would a 3D Kirby game be low quality? It's stuff like this that confuses me. They should've made Kirby Tilt 'n Tumble 2 GBA. It seems all we do these days is wait for things to come out or reminisce of the good old days. Nintendo just hasn't gotten the message yet. They are willing to put there flagship console on the chopping block for their handheld and those that bought the wiiu are getting tired. 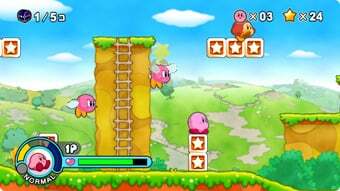 If only we get Kirby no KiraKira Kids (Kirby's Super Star Stacker) for NA. That was the best original Kirby puzzle game for the Super NES. I was surprised they didn't even bother putting that one in the Kirby Anniversary Collection for Wii. Sometimes it's not that simple. Sometimes the game is just fundamentally, well, boring. If a few changes are all that's needed to make a game great, I'm sure that's the chosen course of action. But you know when a company like Nintendo scraps a game for low quality, it's for good reason. Most likely the game was completly unsalvageable. If they made a 3D Kirby game in the vein of Mario 64 or Banjo-Kazooie games, i'd actually consider playing a Kirby game for the first time in about a decade. The Kirby formula has been so overdone and after Kirby 64, i just lost interest. Rockstar did work on a Kirby?! I never knew this! I tend to forget about Kirby due to Nintendo having so many other great franchises. But Kirby's Adventure and Kirby 64 are a couple of fantastic games. I'd like to see them revisit the idea of a 3D Kirby game, it would be really neat to play. Everybody seems to have a constantly work on sequels. I quite like Air Ride and Dream Course. Really liked Adventure Wii (Return to Dreamland) but I am not bothered for another just yet the delay was about right last time. That Gamecube game looks amazing! Reminds me of WarioLand Shake It. Why couldn't Nintendo adopt that style with more games? Nintendo really need to do some projects that pull up and away from looking like the trademark nintendo visuals in sharper HD. Big bold colours on rounded chubby characters only need minimal hardware to look good. They need to drive 2-3 franchises into the next gen HD era, or a new IP that shows the Wii U isn't just a cartoon game machine. I'm looking at Zelda, Metroid and F-Zero or a new IP. @unrandomsam The problem is partially with the fanbase. They always demand sequels. Everytime Nintendo does develop something new, more often than not, their fans complain about them not working on an existing franchise. Also, Nintendo of America is rather lacking when it comes to advertising new IP. It ends up being a problem where the majority of new IP's do not sell well AND they get flak for not developing sequels. I always felt that a Kirby Tilt n Tumble game would have been perfect for the Wii using the motion sensing Wii Remote. There was also a kirby game for the gamecube (kirby adventure) that never made it the game looks great and would be one of the biggest kirby games. Kirby Bowl looks like it would be a nice revival paired with today's tilt-sensitive controllers and handhelds. What about that cancelled Kirby game for the CD-I, I think it was called Kirby's 5-star motel. I wonder why they didn't call it hotel? @absuplendous I agree! That one looks SO amazing. I love the art style and hope to see a game like that come out soon. It's strange to think that the team behind the GTA series were going to make a kid friendly game for the Kirby series. I guess it shows the evolution developers go through. Ah yes, I'm familiar with all of these. I think people need to keep in mind that HAL Labs is a second party company with quite a bit on their hands. They've had to take over the steering wheel after Sakurai (in regardes to Kirby games) and have recently had to also go forth without the help of other such companies like Flagship. Translating Kirby into 3D platforming was posing a challenge for them and if played as awkwardly as can be assumed, than we know why it had to be canned for quality. I so desperately want them to revisit the idea though. They certainly aren't afraid to experiment with Kirby that's for sure. As much slack as this franchise gets for playing "all the same", Kirby games have had some of the most unique gameplay that have taken the most advantage of their respected hardware. Even these cancelled titles indicate that as well. Tilt and Tumble, Canvas Curse, Mass Attack, Triple Deluxe, Air Ride, Kirby Super Star, K64, Kirby's Dreamland 3, Amazing Mirror, all play so differently. About the only game I can say is truly a rehash may be Squeak Squad which brought ZERO new elements to the platforming series of Kirby games. Still was fun though. I dream of a day that HAL will be able to translate Kirby and his amazing powers and movesets into 3D platforming!! Who knows what they're working on next. Regardless I can count on it being a wonderfully charming, beautiful looking/sounding, and enjoyable experience! @KeithTheGeek Oh god, that gamecube trailer from years ago is still the stuff of my dreams. Especially as such a big KSS fan, it was basically 3D KSS with what looked like amazing bosses, and 4 player co-op. I mean I can't complain that now it's got MK and Dedede in there as playable characters, but I do miss that idea. @DESS-M-8 I'm 26 and I love the cartoon styles > realistic grim dark edgey games honestly. I don't like the storybook style honestly...I'm not very big on hand drawn art. For Kirby, I prefer 3D character models. I absolutely want sequels to Kirby's Dreamcourse (SNES). I can think of names too. Kirby's Dreamcourse 64 (N64), and Kirby's Dreamcourse 3 -Cubed (Gamecube). Too bad they don't exist. As for ones mentioned here. The last one pictured-"a more traditional Kirby platformer that would feature animated, storybook-like visuals and enhanced copy abilities..." It looks really great and I would buy it even though I'm not that into traditional Kirby games, or most Kirby games for that matter. Nice article! Would like to see more articles on "lost" games. They really should make a 3D Kirby one day (a platformer, not a racing game like Air Ride). They really should do Kirby tilt n tumble 2 on the Wii u! "They really should make a 3D Kirby one day"